you look gorgeous each way. "Leaf Lines" is a series of collaborative artworks by artist Miriam Adams and poet Suzanne Noguere; each piece is an integrated combination of drawing and text. The inspiration and subject are the leaves of trees growing in the northeastern United States. 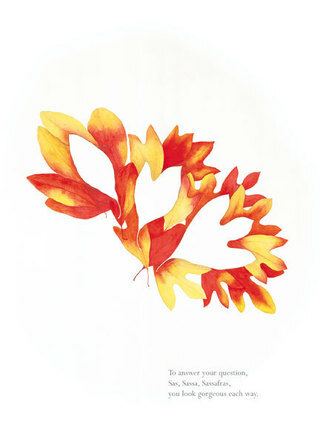 Although the leaves are drawn realistically in pencil and watercolor, their arrangement on each sheet of paper is often abstract and unexpected. Each image is integrated visually with a poem, some as short and immediately apprehended as haiku, others longer and more meditative. In some poems the leaves or trees are the subject; in others they appear as a metaphor for human life. Natural history and human history are interwoven. Proceeding from spring through winter, the series sets cross rhythms in motion. Recurring elements—particular species; the motif of paper; a poem marking the transition from each season to the next; Asian, classical, and American references—develop into an organic unity. The underlying viewpoint of the series is that the leaves and trees are both beautiful and valuable and that our lives are unimaginable, indeed impossible, without them. The series ends by addressing the ancient Sibyl of Cumae in what is, in effect, a call to action to stop worldwide deforestation. 26 drawings in graphite and watercolor on paper, 22.5x30"
Text is silk screened onto plexiglass and superimposed on the visual image. "Leaf Lines" is available for exhibition in art galleries, art museums, natural history museums, and botanical gardens. Please request portfolio to preview the series.